One of the most popular heresies today is that we are in some form of the Kingdom: a spiritual kingdom, an already-not yet kingdom, a partial kingdom. Yet none of this is based on the Bible. Acts 3:19-21 makes it clear that Jesus must be here for the kingdom to be in existence. Not only that, Israel must be all back in the land, or there is no kingdom. Moreover, Israel must be fully regathered, or there is no New Covenant yet. This is clear from this passage. Learn this issue because it is a root of much error in the church today! The large percentage of Jews in the church in Acts were well versed in the wording and vocabulary of the Old Testament and the Mosaic Law. They also had a great sense that some radical change was afoot, that something important was about to take place. So when Peter used specific, distinct vocabulary and phrases when he spoke to them in Acts 3:23, they were sure to have recognized immediately that he was quoting from Deut. 18:15 and comparing the prophet Moses to the Prophet to come. But what was so distinct and unique about Moses compared to other prophets? Who was this Prophet to come? In this lesson, we learn that these two prophets had in common the role of legislator, mediator, royalty, and leadership. As we continue in our study of Acts, we see how Chapters 3 & 4 fit together. In our previous lesson, we saw Peter challenged by the Sandhedrin, a council of approximately 71 priests, temple guards, and Sadducees, and how he dealt with them. These Jews knew full well that there was proof of an empty tomb, yet their hostility toward Peter's message was evident. How did Peter handle them? Scripture says Peter was "full" of the Holy Spirit. Is this the same as walking by means of the Holy Spirit? Peter boldly challenges the Sandhedrin, and we are introduced to Apologetics. In this lesson, we begin to learn how we believers in the Church Age can accurately apply the doctrine of Apologetics in our own lives. Apologetics. What is that? Does it mean giving an apology for something or to someone? As we learn more about this doctrine, we discover the difference between an "evidentialist" vs. a "presuppositionalist". This lesson explains the Biblical approach for believers who encounter those who say "don't confuse me with the facts - my mind's made up!" "What shall we do to these men?". This question was asked by the Sanhedrin, the legitimate Jewish governing authority. Because of Peter and the apostles' stand, the Sanhedrin lose face, and Peter is put in jail. This act was clearly uncalled for, yet it happened. How did Peter choose to handle this unjust act? As we begin this study, we are reminded that authority is established by God and that it exists in every area of our lives, from husband/wife, family, government, to the local church and our employer. As we learn more about God's mandates regarding how we are to regard authority, we will be able to apply these lessons to a current modern day issue many of us find ourselves faced with: obedience to our own governing authority. Is there any correlation between witchcraft and rebellion against authority? Are Christians a law unto themselves? The underlying issue in all of human history is really an issue of authority. Under what circumstances then, does a Christian have the responsibility to disobey authority? In the third lesson of this special side study on authority, we learn that there are limits to authority and look at passages that begin to explore these limitations. This is an extremely important area of study during our current times and begins to clarify exactly what a Christian's position should be in every area of authority in their life. 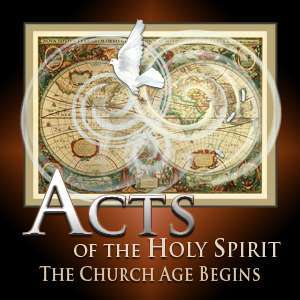 As we continue our study in Acts 4, we gain more insight into how a Christian is to submit to authority and how to handle hostilities by applying spiritual wisdom in a pagan world.